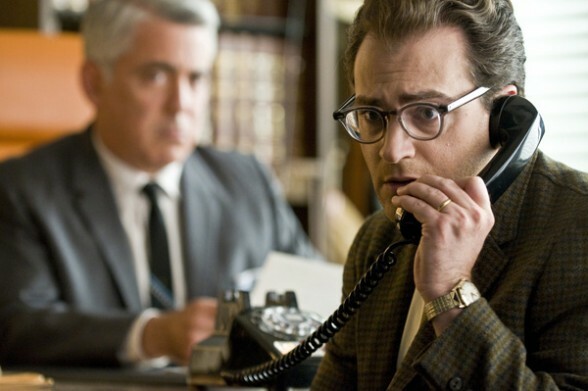 Michael Stuhlbarg as Larry Gopnik in "A Serious Man". Larry Gopnik, the lead character in the Coen brothers’ bleak new movie, “A Serious Man”, lives the life of Job. His wife, ready to shack up with their recently-widowed neighbor, has demanded a divorce; his tenure request at work (he’s a college physics professor) looks like it might be denied; his deeply depressed, unemployed brother, who’s been sleeping on the sofa for who-knows-how-long, is in trouble with the law… and that’s not even half of it. We wonder how Larry is able to survive a single day in his topsy-turvy life, let alone a week, a month, a year; worries just keep piling up like latkes on a platter. And that, more than anything else, is the problem with the film. The Coen brothers lay on the tsuris, or woe, with a trowel. Michael Stuhlbarg as the bewildered and bespectacled Larry is excellent, but we were left wondering where the brothers’ funny bone went; it certainly wasn’t on display here — at least, not nearly often enough.